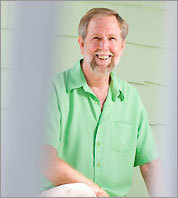 Doug Rauch was an early Trader Joe's employee, and served as the company's CEO from 1993-2008. He recently addressed the Western Growers' Association annual meeting in Scottsdale AZ, and spoke about the keys to Trader Joe's success. Rauch didn't do too much to pull back the company's famous veil of secrecy, but he did present a brief history of the company highlighting the decisions management made that, in his view, turned it from "a 7-Eleven with a great wine department" in the mid-70s into the cult brand it is today. Rauch quoted my favorite saying, "culture eats strategy for lunch"and while he didn't come right out and make the central point of Build a Brand Like Trader Joe's, which is that the chain's real success comes from millions of pleasant personal interactions between customers and crew members, he did cite another of my favorite cultural brand examples, Southwest Airlines. For more on Rauch's talk, visit The Produce News. Before the Thanksgiving turkey leftovers have cooled, the official Christmas shopping frenzy will begin on 'Black Friday'. This year, Walmart faces a potential disruption as many thousands of its workers are determined to protest their treatment there. I don't want to read too much into this particular 'strike' (it's not a real strike, Walmart's not unionized) but it's tempting to see this as, perhaps, the beginning of an uprising against the low wages that attend Walmart's low-price obsession. Ironically, when I was researching Build a Brand Like Trader Joe's I came across ample evidence that suggests that Walmart's profit would actually increase if it paid its workers more. Trader Joe's is anti-union too, but it does pay Crew Members a living wage. Right now, offering starting salaries in the $11-12/hour range and easy access to a rudimentary health insurance program allows Trader Joe's to pick and choose the best retail employees. I'd be willing to bet that Trader Joe's per-square-foot sales and profit are at least as good as Walmart's. Walmart won't kowtow to its workers' demands right away -- in fact, I expect they'll retaliate against anyone they perceive as fomenting this conflict. But I have the feeling that the American shopping public may be on the verge of an epiphany -- egged on by strike supporters like MoveOn.org and the 'occupy' movement. Will shoppers finally realize the impact that Walmart's relentless drive for low prices has had on American manufacturing jobs, middle class wages, and even popular taste? If the shoppers take the workers' side, Walmart will have to change the way it does business. Trader Joe's is a great model. Last Thanksgiving, when I worked at Trader Joe's in Kansas City while researching Build a Brand Like Trader Joe's, the arrival of the turkeys was a big deal. Trader Joe's only stocks turkeys for a short time leading up to Thanksgiving -- the chain doesn't even bring them back for Christmas. They're pre-brined, and sell for $1.99 a pound. Trader Joe's price point -- less than half the price of pre-brined Diestel turkeys from Whole Foods, and more than 1/3 off even Costco's price for comparable birds -- is attention grabbing. But when the San Francisco Chronicle roasted a variety of pre-brined turkeys for a comparison test, they rated Trader Joe's lowest of the five they tried. Trader Joe's All Natural Brined Young Turkey ($1.99 per pound at Trader Joe's)If the frozen Target turkey exceeded our low expectations, then the Trader Joe's turkey left us almost universally disappointed.This turkey, enhanced with an 8 percent salt solution, was by far our least favorite - or, as one staffer put it, "bleh. ""No flavor," "bland" and "cheap tasting," this turkey "needs big-time gravy," said other judges.Yet even gravy wouldn't help its texture, which was alternately described as "dry," "tough," "sinewy," "spongy," "waxy" and "rubbery." To be fair, none of the Chronicle's birds got particularly high marks, but it's certainly possible that in an effort to bring the price in so far below even Costco's benchmark, quality's been sacrificed. Meanwhile, while Trader Joe's of course never releases financials, Whole Foods has been on a tear this year, opening stores, increasing same store sales, and posting profits 50% higher than last year. That might be hard to believe, after the election year we've just come through, in which we've been constantly reminded of high unemployment and the weak recovery from the recession, but the truth is that while the country as a whole is faring no better than the turkeys in the Chronicle's test kitchen, the people who are doing well enough to shop at Whole Foods are doing very well indeed. A few months back, I had (appropriately enough) lunch with Alana Muller, who was just putting the finishing touches on a book entitled Coffee, Lunch, Coffee. Last week, a copy of her book landed in my mailbox. 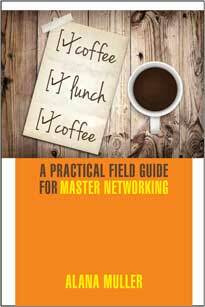 Alana calls it, "A practical field guide for master networking". The title of Alana Muller's book refers to the single-minded way she went about building her own personal network. Her goal was to have three meetings a day; for coffee in the morning, lunch, then coffee again. Before she headed the FasTrac program, she was a fast-rising young executive at Sprint. But the writing was on the wall at a company that had rarely been profitable and it was time for a change. The challenge: She'd spent her career in one company, and had few connections outside it. She turned building her personal network into her job. As you'd expect from an MBA grad, she embarked on her networking plan with due diligence, and documented every step. Alana's organized hundreds of tips into a practical workbook full of simple exercises that will take socially inept types (e.g., me) through the steps required to build their own networks. 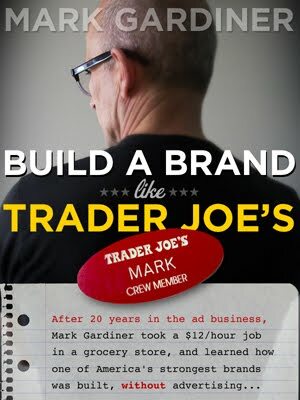 Like my advice on building a brand like Trader Joe's, it's simple stuff -- though not necessarily easy, there's hard work involved and it takes perseverance and discipline. Coffee, Lunch, Coffee readers don't have to go it alone, however. They can download a spreadsheet to keep track of their progress, and refer to Alana's Coffee, Lunch, Coffee blog for ongoing advice. The book concludes with Alana's email address. If you want to build your network of personal connections (or improve the one you have) this book's highly recommended. Signed and inscribed copies are available directly from the author for $20 here. The price includes free shipping. Olson deserves extra credit for selling Whole Foods on an ad in which the cook/narrator spoils their main dish at Thanksgiving. (In another spot, the dog eats the turkey.) By writing these scenarios, Olson immediately put Whole Foods in a completely different space than any other grocer. All of the rest of them are emphasizing just how perfect their food always is, and promising that their customers will be the hostess with the mostest. But Olson didn't just differentiate Whole Foods, the agency also turned the ad into a subtle message about relationships, and not food. That's a great choice for Whole Foods, which has long been derided as 'Whole Paycheck'. The subtle message here is, "It's not what the food is worth, it's what your friends and family are worth." Olson's spots for Whole Foods encourage customers to get into the kitchen and cook -- an activity that fewer and fewer Americans take time to do, in an age when more than half of all meals are prepared outside the home. The spots reassure Americans unfamiliar with their own kitchens by telling them that their friends and family will appreciate their efforts, whether the results are worthy of a Michelin star or not. Olson and Whole Foods also know that getting people back into the kitchen is the best way to make them appreciate quality ingredients. That, in turn, is another good way to inure the grocer against consumer pushback over premium prices. Although Trader Joe's is a pretty unique grocery concept, Whole Foods is the chain most often compared to it. You'll be able to freeze a turkey in hell the day you ever see Trader Joe's running TV commercials, but I think Olson's spots for Whole Foods highlight another key difference between the two chains. While it's true that Trader Joe's brings in turkeys before Thanksgiving, the store is not really in the business of selling ingredients, it's in the business of selling prepared foods. For much of its history, Trader Joe's didn't sell produce at all. Then, when customers insisted on it, the chain tried to sell all of its produce in plastic 'clamshell' packaging. That too was an idea rejected by customers, so that now when you walk into a Trader Joe's store, it looks as if produce is roughly as important to Trader Joe's as it is to other grocery stores. But the truth is obvious to anyone who, as I have, has spent a few hundred hours working a Trader Joe's cash register. Nine customers in ten roll up with carts full of prepared foods, not ingredients. Those nine don't cook the food they buy at Trader Joe's, they just heat it and eat it. Here it is, the morning after an epochal election -- at least it was epochal from a media perspective -- and the future looks much the same as the recent past. If you believe the story that Mitt Romney hadn’t even drafted a concession speech, then the Republican party must be a little shocked. Will Aldi apply some of what it's learned from Trader Joe's in the German market? I read that Aldi, which has long been a dominant grocery retailer in its native Germany, now finds that German shoppers are gravitating to shops that offer a slightly more upscale environment and merchandise mix. 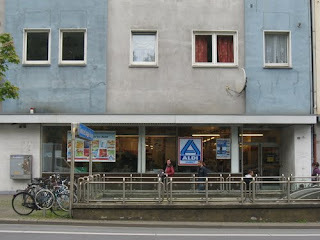 So it seems that Aldi Nord (the company that operates Aldi stores in Northern Germany and which also owns Trader Joe's) may seek to apply a little Trader Joe's magic to its austere brand. Small, dark, and cheap. Those have historically been the traits of Aldi stores. 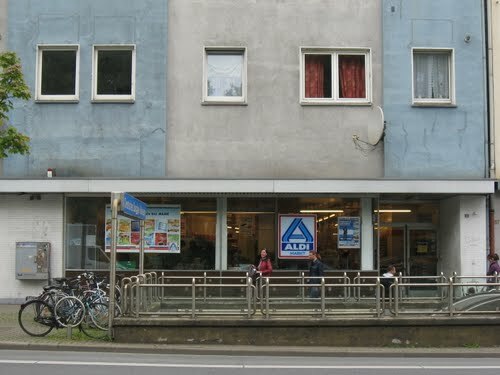 A shop like this one is what comes to mind when most Germans think of Aldi. They also think, "Those guys save me lots of money." Until now, that's been good enough, but it seems German shoppers now crave nicer shopping experiences. Both Aldi Nord and Aldi Sud (the parent company of the U.S. Aldi stores) have had success exporting Aldi's small/deep-discount/house-brand formula to foreign markets. But at home, the two Aldi chains which (taken together) were the single largest player in the grocery category in Germany, have fallen behind rivals with bit less of an East-bloc vibe. Now, Aldi stores are starting to stock a few more name-brand products, like Coke and baby foods (where customers have particularly strong brand preferences.) Some stores have in-store bakeries. Although Aldi is ever-secretive, the word is that Aldi Nord plans to spend about $350M on renovations to its 2,500 or so stores over the next couple of years. Aldi Sud has similar plans. 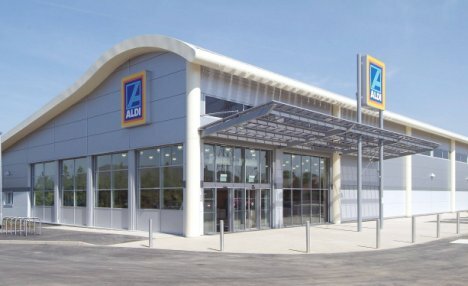 New Aldi stores will probably look more like this snazzy UK one. Aldi Nord already sells a few Trader Joe's products in its German stores. 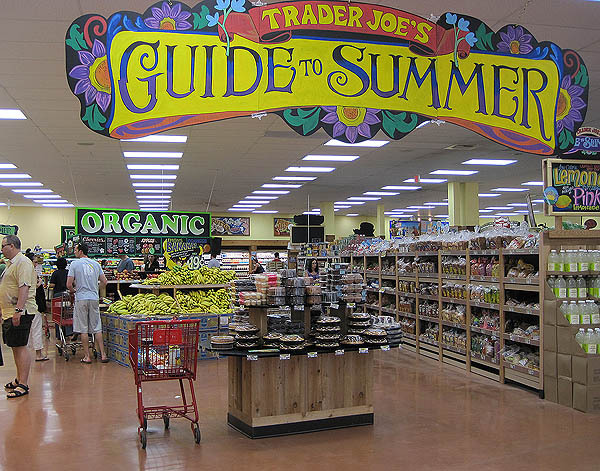 It remains to be seen whether the company will tap Trader Joe's expertise to revitalize its own brand. The stores are similar in some ways; both have fewer SKUs than most supermarkets, although Aldi has far fewer even than Trader Joe's. The big difference is that Aldi stores have made a science of operating with the bare minimum staff. Fast-selling products are displayed right on the pallets, just as they came off the truck. 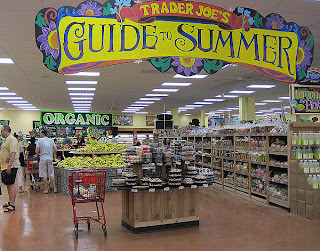 By contrast, Trader Joe's stores have more staff per square foot than most grocery stores, in order to maximize contact between the brand and its customers. How many cues will Aldi Nord take from its successful American kid?